Thanks for your comment, Sedge! Another cracking image! Really moody and ethereal! You images continue to amaze, all tell a story, deep and moving. 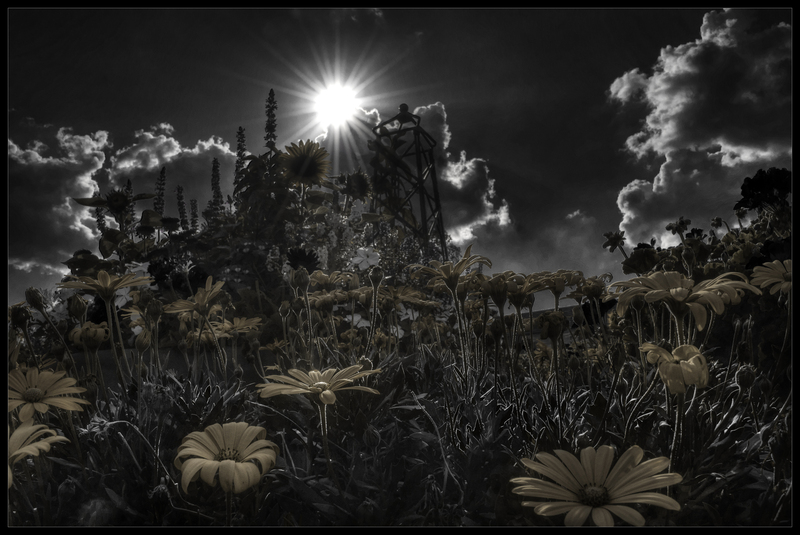 Really like that, go on then give us a clue, mono conversion, selective colour then de-saturate? Thanks Russ. That’s pretty much the formula. I split the colors using a different technique than I usually do on this one. The colored version on the bottom layer, the converted one (done with the b&w adjustment mask) above it. Set the blend mode to dark on the b&w mask and went back to changing the tones on the mask. It worked nicely but turned out to be more work in the long run instead of using the direct approach. The only additional step I did was using a hue/saturation mask on the final layer. The yellow was still too bright, so it needed to get shifted slightly towards red and desaturated a bit. Another world, another time, another place. Giant flowers under an alien sun. Brilliant…… an ordinary garden with ordinary flowers transposed by viewpoint, exposure control and a bit of colour tweaking into something wondrous. Creative photography at its best. Well done Robert. Thank you, (D)OCULAR, indeed it does. I think I see a werewolf lurching in the back part. I probably should bring a silver bullet with me next time, just to be sure. 🙂 Thank you for your visit and comment, Carl! Holy moly, that is one of a kind image to me. When my 10 year old started this one, I didn’t even know what they were for. I wish it could be a paying job. Babbling again. I love this one! Surreal and ‘other worldly’. Fantastic image. Very well done. Really great work – agree with the other comments above. Exactly what I’ve come to expect from you, Robert! Great! My imagination was caught by the tower in the background and would love to see more of it. Clever composition. Makes me feel like I’ve been shrunken down and tossed into an unfamilar world! Ive nominated you as one of my top picks for a blog award 🙂 your blog happens to be one of my favorites! see the full post on min if you like, and keep up the excellent work! Very kind of you to nominate my blog, Ramshazia. Thank you! Thank you David, for your kind words and your reblog! I appreciate it! I was your 100th like, and a well deserved like for you. I loved this image. Talent oozes from your camera. Thank you for your visit here, Alex. And thank you also for your kind words! Awesome as usual Robert! I love this interpretation! It makes me feel like I am a cricket on an acid trip. Kudos. Haha, I think that’s the best possible description for this photo. Thanks for your comment! Good HD processing Robert. A nice look and professional. All your work is professional. What a fantastic, otherworldly image.. The immediate impact I got on opening this image says it all for me. Great image. Thank you, Peter! Your photography is amazing! That’s a really cool shot Robert, I would never have drempt of processing like that.